The phrase “modern artist,” which is now hoary with age, calls to mind a certain outlook. The modern artist is an outsider who “explores new territory,” “challenges convention,” and “transforms the way we see.” He or she is at once innovative, urgent, difficult, radical, discomfiting. The shock of the new, etc. If you relish the effort to wrest meaning from the modern world, you’d have to be dead not to admire this particular model of the major artist. But it’s also important not to force contemporary artists, out of misguided nostalgia, to play the part. There are today fine painters working in the old modern tradition who are anything but radical revolutionaries. Their value lies elsewhere. 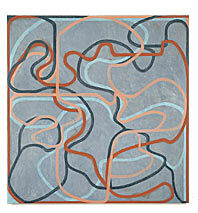 Brice Marden is a late modernist of this kind. The subject of a retrospective at the Museum of Modern Art, Marden, who is 68 years old, is a fashionable abstract painter and art-world insider. He became successful at an early age, displaying an unerring feeling for the issues of his time, and he’s long been popular with critics, collectors, and smart society. There are those who would rather not think of Marden as a fashionable painter, as that doesn’t fit the romantic model. They would be even more horrified to admire him, as I do, for being the best sort of conservative—that is, one who protects important traditions. Today, many artists are illustrators and idea junkies, without much interest in the meaningful play of form. Marden respects the visual. He insists upon the eye, even now. In the sixties, when Marden came of age as an artist, Minimalism was taking center stage and Clement Greenberg’s arguments—especially his emphasis on abstraction and the two-dimensional surface—were being widely discussed; the Abstract Expressionists were receding into the past, but Jackson Pollock and Barnett Newman remained influential. Marden’s early work was a masterly synthesis and consolidation of this moment. 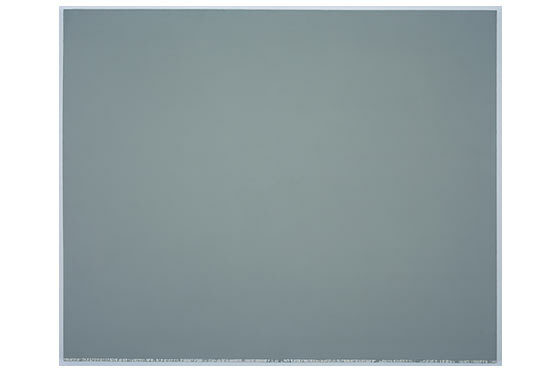 He began making almost monochromatic pictures that appeared “minimal” but were also full of AbEx ambiguity and resonance. In Nebraska, viewers came upon a soft green panel that, at first glance, looked like almost nothing at all. But Nebraska was not as abstract, empty, or theoretical as it initially appeared. Its ascetic light seemed personal. It had much in common with the moody art of Rothko, Newman, and Agnes Martin. Its colors not only came from the store but were inspired by the actual landscape of Nebraska. And its surface was neither cool nor mechanical. In contrast to many Minimalist artists, Marden retained touch as an essential value in his art. His paintings were obviously handmade; elegant, subtle, Whistlerian. Along the bottom of many, he left a narrow unpainted strip (which some people do not notice); it would fill with drips as he worked. A Minimalist theoretician would describe this as a sign of the artist’s “process” or “the history of the painting,” which in that period stood for a kind of honesty. Marden wouldn’t disagree. But the strips also gave his one-color planes an enlivening visual tremble. They added air too. In the linear Mardens, there is typically a structural system: The differently colored lines may, for example, be interwoven onto the plane in a certain order. But an artist who enjoys the idea of composing poems on bark is obviously not a stickler for such things. (Marden often draws with sticks.) In the modernist way, his line can appear rough and awkward, but, this being Marden, it invariably looks elegant too. Some viewers find such effects precious or offensively tasteful, but I like the emphasis on form, and they are in any case natural in a painter who extends rather than upends a tradition. Marden’s line also evokes both Pollock and de Kooning but without their fire. There is instead a kind of fine afterglow—Pollock and de Kooning recollected in tranquillity. Museum of Modern Art. Through January 15.